Naturally, the next day I wake up with a pounding headache muttering to no one in particular how I’ll never touch a sip of alcohol again and in desperate need of food. Here’s the problem… January 1st is the only day out of the entire year when Tokyo is an absolute ghost town. Practically all restaurants and stores are closed; their Japanese proprietors are off climbing mountains, hoping to catch the first sunrise of the New Year or praying for prosperity and protection at their favorite shrine. Luckily for the less pure of heart, massive Western chain restaurants like Denny’s remain open for business. At the joyous dawn of this New Year my husband and I spotted the canary yellow sign from our 23rd floor hotel room in Shinjuku and dragged our butts across the street to the brightly lit restaurant. While it’s said that when you’re drunk your foreign language conversational skills are exponentially better, I can attest that when you are hungover your foreign language reading skills are atrocious. But what one learns when they are six years old can never be forgotten and thus I did my best to translate the mainly katakana menu. As I’ve said before Denny’s in Japan doesn’t serve platters of pancakes the size of your head or give you the option to “build your own Grand Slam” but I guarantee that you will find something to ease the pain. My breakfast was called “Hamburger Mountain”. 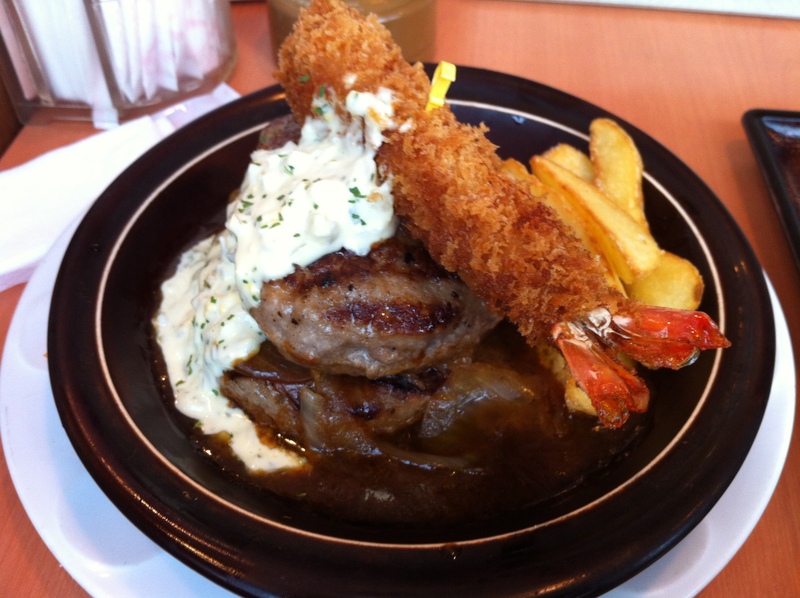 A double hamburger patty, smothered in demi-glace with a panko-crusted shrimp straddling the mounds of beef. The tartar sauce cascading down the side did its best to replicate “mountain snow” (not making that up, it was part of the description). The dish came with fries but I opted to make it a Japanese set meal, which added pickles, rice, and miso soup to the feast. Side note: if you don’t already know this, miso soup is a fabulous hangover cure. Craving a little taste of home, my husband ordered the “Demi-Glace Hamburger”, a beef patty with a fried egg and thick-cut French fries. I believe the accompanying corn and spinach was the Japanese attempt to “health-ify” the meal (sorry, he inhaled it before I could snap a picture but you can check it out here). Perhaps one of the most welcomed aspects of the meal was the free coffee refills. In Japan coffee is small. I mean really small, something that a coffee producer might turn out as a product sample here in the U.S. The endless refills revived my husband, but may have forced management to look into slapping a limit on that offer. (I don’t drink coffee. I wasn’t lying about having zero vices). The final cherry on the top of this beef & demi-glace sundae was the tiny call button on the table. No need to raise your hand or catch the eye of your busy waitress every time you need your coffee mug or water glass refilled, simply push the little button and a smiling member of the gracious staff showed up tableside in a matter of seconds. Our total came to something close to $25. A steal when compared to the price we would have paid had we opted to eat the special New Year’s Brunch in the hotel (about $40 a person). Satiated and caffeinated we toddled back to our room… where about 20 minutes later we rode out the 7.0 magnitude earthquake that rocked Tokyo at 2:30 that afternoon. That’s about the time we agreed it would be prudent to visit the Meiji shrine the following day and ask the kami [gods] for protection and prosperity throughout 2012.